My Best Peanut Butter Pie is rich and so satisfying. Peanut butter does not last long in my house. My family is addicted to all varieties from crunchy, smooth, name brand or generic. We love it so much that I love to make this creamy pie with a pudding like consistency to enjoy it further. To give my Best Peanut Butter Pie recipe even more appeal, I top it with a meringue. Here’s my pie before meringue in the oil pie crust. This is a simple pie any inexperienced baker can handle. Make that same oil pie crust that I constantly urge you to try because it is the easiest recipe and always turns out flaky and tender. I promise! Trust me, but you are going to love this pie. You won’t believe how easy and delicious my Best Peanut Butter Pie is. Tasting, however, is believing! Take your eggs out and leave at room temperature so they will separate easily. Prepare your pie crust first, poke the bottom of your crust lightly with a fork and then bake at 400 for about 10-15 minutes until lightly browned. Let cool and begin working on your filling. Use your whisk to mix your 3 egg yolks and the 2-1/2 cups milk together in your saucepan. Cook on medium heat, stirring constantly until warm. Combine your 3/4 cup sugar and 1/4 cup flour thoroughly in another mixing bowl until well combined. Slowly add this sugar-flour mixture to the warming yolks and milk. Keep stirring constantly while slowing adding more of that sugar-flour mixture until emptying that mixing bowl into the saucepan. Cook this combined mixture until it thickens and bubbles. Remove from the heat and stir in your 1/2 cup peanut butter and 1 teaspoon of vanilla and mix through. Pour the filling into your baked shell. Either you enjoy your pie plain or top with meringue or your favorite whipped topping. I like to make meringue and use up the 3 eggs whites. 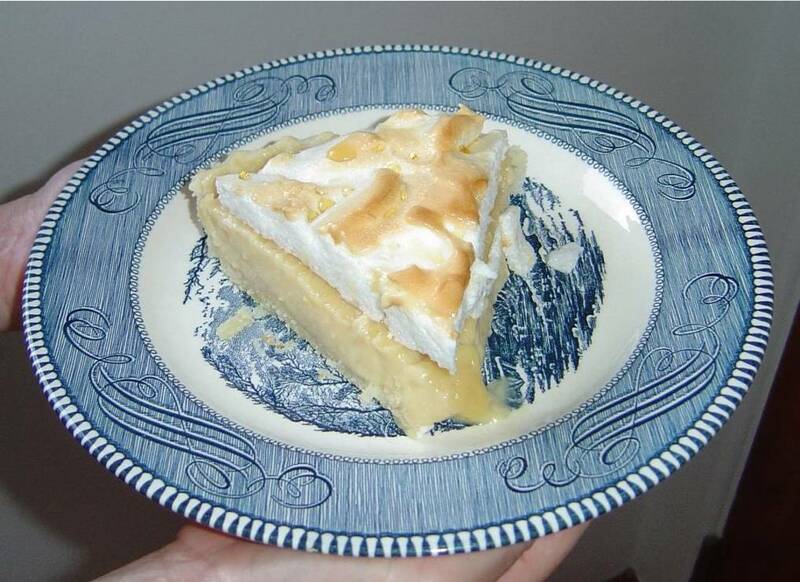 If you’re using the meringue, bake the pie for about 5 minutes at 425-degrees to lightly brown. Cool and then cover and refrigerate your pie.